What's New - scottmcculloughbuilders jimdo page! 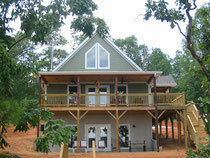 Scott McCullough Builder has been serving the Lake Gaston and surrounding area for over twenty five years. He offers quality craftsmanship in constructing your home, whether it is a custom stick frame, a log home or systems built construction also known as modular. Building trends tend to change, influencing interior and exterior materials used in the home. 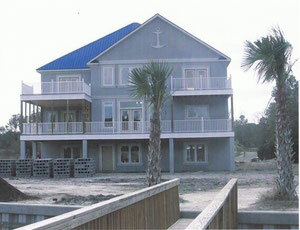 He has remained consistent about insuring the use of high quality materials for his homeowners. Being energy conscience is just as important to Scott McCullough Builder and that’s why he is now an ENERGY STAR® partner and builder of ENERGY STAR qualified homes, providing his homeowners with features in the home that has added value because of the use of effective insulation, high performance windows, properly sized heating and air conditioning units to increase efficiency, lighting and appliances that are ENERGY STAR rated. Let us tell you more about our recently completed ENERGY STAR® certified home! 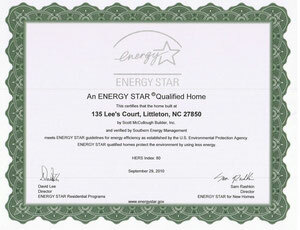 We are proud to announce the completion of an ENERGY STAR® certified home!! This beautiful home is a modified version of our Sunrise model. As part of the ENERGY STAR® certification process, we worked closely with Southern Energy Management as they conducted rigorous inspections that ensure both the quality and energy efficiency of this home. This home meets or exceeds the standards required for ENERGY STAR® certification. 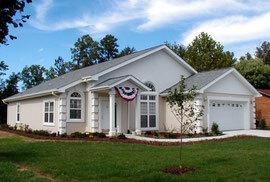 For more information about green building and ENERGY STAR® certified homes please contact us. We look forward to hearing from you soon!! Do you need repairs, renovations or restorations or do you need to add on to an existing log home or "stick-built" home? Give us a call or stop by our office to discuss your building needs! We look forward to hearing from you soon!! Let us tell you more about the homes with exterior walls constructed from solid concrete! These homes are highly energy efficient and relatively inexpensive. They are adaptable to all house plans. Please contact us for more information. We look forward to hearing from you soon! !